VeryPDF Barcode Recognition SDK is a highly accurate and powerful developer library which recognizes 1-D and 2-D barcodes from digital images and bitmaps. Using this SDK you can integrate barcode recognition functionality to your document processing systems, Windows applications, embedded systems (Windows CE, Pocket PC, Smartphone) and Web services. The following image formats are supported: BMP, TIF, JPG, PNG and multipage TIF and PDF (Portable Document Format). The unique and fast barcode recognition algorithm searches for barcodes in any position and orientation from your images. VeryPDF Barcode SDK (Software Development Kit) was developed from the form recognition algorithms, which has been used successfully for years. It recognizes the barcode symbologies Codabar, Code 2/5 interleaved, Code 2/5 Industry, Code 39, Code 39 extended, Code 32, Code 93, EAN 8, EAN 13, UPC a, UPC E, Code 11, Code 128 and EAN 128. We also support GS1 DataBar (POS) barcodes! New are various Post Codes like Royal Mail Barcode, Dutch Code KIX, Australian, Canadian CPC, Code One, Intelligent Mail Barcode IMB, PostBar, PostNet, Planet Code. The most common use of barcode recognition is quick and reliable identification and indexing of documents for data capture (OCR, ICR, etc.) and archiving. Optionally you can receive two-dimensional barcode recognition: PDF417 barcode, Aztec Code, QR Code and Data Matrix (not only ECC200, but also ECC000-140). The complete character set and binary data can be encoded in two-dimensional barcodes, up to 3,000 characters. The Data Matrix barcode was designed for small parts marking and is today used for small electrical parts, by the pharmaceutical industry for unit dose packaging, by the automotive industry and by NASA. 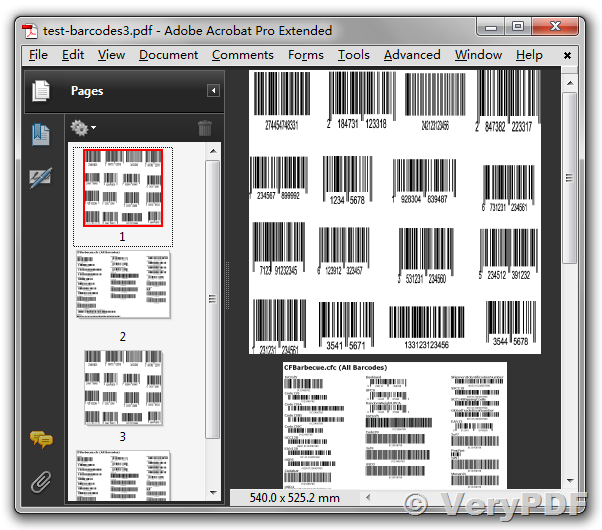 VeryPDF Barcode SDK is permanently improved and will be extended with new features. Detailed information about the bug fixes and improvements you can find in the history. This entry was posted in Barcode Generator and tagged barcode api, barcode generator, barcode ocr, barcode pdf, barcode reader, barcode recognition, barcode sdk. Bookmark the permalink.